Pacifism is the essential value of both the Maitriyana as well as the Human Rights, being present in the historical development of a civilization of peace whose political, economic, cultural and environmental instruments are regulated by the pacifist universal ethics. Indeed, peace is not only the Purpose (Dharma) of Buddhist Socialism, but it is also the social order, the ideal of the international community, the aim of the right to education, the good of security, the essential element of development, the right of every human being and people, the human aspiration and state obligation. For Maitriyana a new peace civilization shall replace the current civilization of war and violence, but it will be originated in the mind of individuals which is where real conflicts arise. Thus, in the Buddhist Socialism it is considered as integral peace to the interconnection between the inner peace and outer peace, the latter being the ideal of social, planetary and cosmic harmony. In Maitriyana, the Universal Declaration on the Right to World Peace is preceded by 2600 years of teachings of spiritual masters who have been the foremost experts on the human right to peace that have existed in history. Thus, the sense of Purpose (Dharma) of the Free and Enlightened Being (Arhat-Bodhisattva) requires the States of the world to open their life practices to the transcendental milestone that involves creating a pacifist global civilization. It is precisely in the Buddhist Socialism which it is clearly reflected this search for peace as a universal value and archetype of human rights, which means that peace is not merely the absence of war but also the Cure (Nirvana) of the ills of injustice, ignorance and pollution by removing all kinds of violence, whether political, economic, cultural and environmental, both individually and at a collective level. This happening of solidarity in the world involves ethical evolution and Spiritual Awakening (Bodhi) of humanity. The Maitriyana then works for the sacred human rights, such as peace, healthy living and sustainable environment, considering that the Right to World Peace is an integrative right without which the other individual and collective rights are irrelevant or lack of validity. The conception of the human right to peace reaches a global and universal validity, reaffirming the intrinsically free and spiritual character of human nature, so it requires all the world’s governments to accept these ethical foundations in order to reach the future. Therefore, the spiritual master teaches that peace is inherent in the dignity of the apprentice, but it is also intrinsic to the world of tomorrow where peace and health – the appropriate life – will be the heritage most protected by the peoples. Buddhist Socialism and its Universal Declaration on the Right to World Peace mean the biggest advance of the Path of Purification of humankind and the establishment of a civilization of peace, where every subject, group and people enjoy the fulfillment of the human right to righteous peace. This means the Desire that the entire humanity, without any discrimination, has full access to social justice and peace education, by creating social bonds of solidarity and mutual support in order to solve all conflicts fairly and non-violently. Thus, the apprentice who unlearns the framework of the civilization of war moves away from selfish politics, consumerist economy, the dualistic culture and polluted environment. This abandonment is the acquisition of a highly useful competition because the ethics of Detachment is the ultimate tool to participate in society with an attitude of prevention, resolution and transformation of problems. That is the reason why the Maitriyana is a revolutionary spiritual system that teaches to unlearn the war, injustice, ignorance and pollution, building a new identity for the subject and the people in order to achieve the Salvation of the Earth (Gaia). But to do so it is required the evolution of planetary consciousness by performing chores around peace, freedom and love, implementing civil disobedience of the Free and Enlightened Beings (Arhats-Bodhisattvas) against the oppression of the States that violate the human right to peace and healthy living. World peace is the full main requirement of Liberty and Human Rights, providing equality and fraternity to all the peoples. Peace, justice and compassionate wisdom (prajna-karuna) form a mystical triangle that is the platform of genuine development of humanity. However, these supreme practices depend purely and solely on the identification of the causes of global ills, seeking their prevention from mental roots. Thus the spiritual master works with courage for world peace and healthy life of all human beings, trying to transmit a style of existence empty of greed, hatred and delusion. It is only through this waiver that violence and war can be vanished, which requires the commitment not only of the apprentice and the State but also of all humanity. Peace is neither an individual nor a state issue but it is universal. Contemporary problems demonstrate that it is fundamental a new system of planetary civilization which is not governed by war but by pacifism, influencing the levels of what is individual, national and global. This Way of peace must be guaranteed by the protection of justice, stability of knowledge and harmony of ecology, by consolidating democracy, solidarity and hope as international values that prevent the apparition of discrimination, conflict and genocide. The Free and Enlightened Being (Arhat-Bodhisattva) then requests the peoples to abandon power of the armed forces and replace it by the power of reconciliation. In this sense, the revolutionary contemplation (kakumei zen) is a call to selfless acts towards the good of others, by promoting the transmission of ethical values based on righteousness, knowledge and interexistence. These universal principles are essential for the construction and development of peace civilization, because they respect the inherent dignity of life at all times. Thus the spiritual master brings a message of love that can heal and transform the world, strengthening the transindividual identity of the peoples. This project of globalization of peace that Buddhist socialism solemnly proclaims does not lead to uniformity and absence of conflict, but rather to unity in diversity and the overcoming of illusory divisions of any kind, whether political, economic, cultural or environmental. Faced with threats of discrimination, violence and war, the Maitriyana emphasizes a higher modality of learning, by teaching the individual a critical thinking that is capable of taking responsibility for one’s life. In this way, the apprentice who learns libertarian meditation can take on the challenge of changing the internal and external world, by modulating his own destiny on the understanding that peace is not an abstraction but rather a practice and lifestyle. Definitively, peace is a process of Ascension from oppression and alienation to Liberation and Openness (Sunyata), being a spiritual evolution based on solidarity as key to the future of humanity. 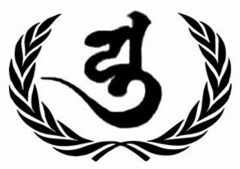 Therefore, Buddhist Socialism adopts the flag of peace, justice, education and ecology in order to save the present and future generations, assuming the messianic mission to protect life, intelligence and Spirituality in the whole Universe. This is the major chance to change the course of the world’s self-destruction, teaching a pathway toward peace and true progress of peoples. This Purpose (Dharma) shows that the Maitriyana is a Way that safeguards the ethical and spiritual heritage of all humanity, protecting the universal values from the attacks received by the superficial and materialistic society. This obliges the Buddhist Socialism to denounce the raw capitalism as a system devoid of equality, the same way as authoritarian communism is denounced due to its lack of Liberty. Indeed, the foundations of a peace civilization not only require Liberty and Equality but also Fraternity and Solidarity among all human beings, eradicating war, poverty, exclusion, discrimination, ignorance and violence. The meaning of life discovered by Maitriyana is in peaceful coexistence, generosity, reason, full consciousness and humility. Only the ethical responsibility and a detached will, characteristic of the peak knowledge (satori) and compassionate wisdom (prajña-karuna), nourish the existence of humankind and sublimate the death and war drive into life and peace drive by transforming lances into ploughs and rose petals. Therefore, the teachings of the Free and Enlightened Being (Arhat-Bodhisattva) are the most noble act and a gift that can be given to generations of present and future, celebrating the healthy and appropriate life through the Universal Declaration on the Right to World Peace, which is the maximum instrument of Buddhist Socialism to respect spiritual nature and the dignified existence of peoples. The Maitriyana is the maximum representation of the utopia of human rights, by practicing them and fulfilling them through the revolutionary contemplation (kakumei zen) in order that the world has a new dawn based on concrete guidelines of peace, justice, education and ecology. Tolerance, non-violence, understanding, detachment, solidarity and life without fear are the fruitful conditions for the future of the Great Awakening (Maha Bodhi) of all humanity, building the bulwark of peace in the spirit of all peoples of the Earth. The highest contribution to the Right to Peace, paradoxically, was not made by international juridical instruments but from the ideals of spiritual masters, achieving the crystallization of the human right to world peace, which supposes an evolutionary leap of the ordinary conception of the human being as naturally bellicose. Thus the doctrine of Buddhist Socialism seeks to respond to conflicts and wars through pacifism, considering the right to peace as a supreme human right. This implies the total invalidation of the use of violent force to resolve individual, national or international conflicts. Indeed, the Purpose (Dharma) for the maintenance of peace and justice worldwide is creating a Pure Earth or Kingdom of Righteousness where democracy, international law, education for all and healthy environment prevail. Indeed, the Maitriyana sees and recreates new perspectives for the ethical evolution of every individual, group and people. This new conception of the responsibility to protect life contributes to the formulation of the peace civilization. Thus, the theory and practice of Buddhist Socialism embodies the convergence between peace, human rights and ecology, understanding at all times that the foundation of the human right to peace is to protect the fundamental freedom or intrinsic human dignity. This contributes to understanding, tolerance and friendship among the entire human family, by promoting the development of activities of libertarian meditation for maintaining healthy and peaceful life. This quest to eliminate war on the lives of the peoples is the highest aspiration both of Maitriyana as well as of the human rights instruments, which are committed to the establishment of a just and lasting peace at a global level. This implies both disarmament and the peaceful resolution of disputes. However, although the rights to adequate peace and healthy environment are paramount human rights, governments often regard them as secondary rights. Peace, as it is conceived in the Buddhist Socialism, includes political, economic, cultural and environmental conditions for the full exercise of human rights. In this sense, the Universal Declaration on the Right to World Peace recognizes peace as an integral development in these four areas, while the right to internal development and fundamental freedoms is recognized. Thus, peace and healthy environment are the basis for the survival of humanity. Therefore, peace is a value and supreme practice, being the necessary condition for Salvation and Evolution of the world, effectively developing the human rights in all peoples, which means recognizing the right to live without armed conflicts, the right to a safe and unarmed environment, the right to a healthy environment, the right to civil disobedience, the right to conscientious objection, the right to opposition against oppression, the right to the protection of the vulnerable, the right to Justice and Truth, the right to the future and the right to the democratization of governments and international organizations. The Maitriyana then acts on behalf of all humanity to claim the respect and fulfillment of the Right to Peace. The happening of the Universal Declaration on the Right to World Peace is the crystallization of two thousand six hundred years of Spirituality, by providing the legal framework and the ethical guidance for building a pacifist civilization. Declaración de Naciones Unidas sobre el fomento entre la juventud de los ideales de la paz, respeto mutuo y comprensión entre los pueblos. Declaración de Naciones Unidas sobre la afirmación y consolidación de la distensión internacional. Declaración de Naciones Unidas sobre el Derecho al desarrollo. Declaración de Naciones Unidas sobre la preparación de las sociedades para vivir en paz. Declaración de Naciones Unidas sobre el Derecho de los pueblos a la paz. J. Galtung, Peace by peacefully means. Anna Bastida, Desaprender la guerra: una visión crítica de la educación para la paz. F. Mayor Zaragoza, Derecho humano a la paz: germen de un futuro posible. El Derecho Humano a la Paz: Declaración del Director General de la UNESCO de 1997. C. Villan Duran, Hacia una declaración sobre el derecho humano a la paz. Declaración sobre el Derecho de los pueblos a la paz. M. Aguirre, Los conflictos económicos y sociales y la paz: el caso de los Estados frágiles. Declaración de Luarca sobre el Derecho Humano a la Paz.